Having grown up in a military family, Vincent Jackson recognizes the unique circumstances and challenges that military families experience. 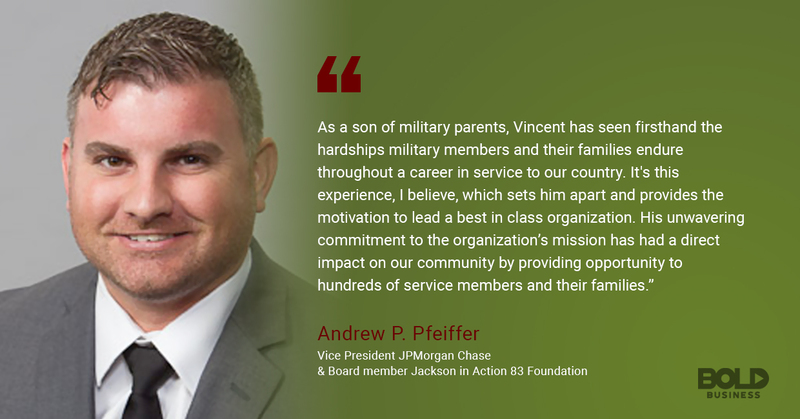 In 2012, the now-retired Pro Bowl NFL wide receiver launched his own military charity, the Jackson in Action 83 Foundation, as a way to support and encourage military children and families. The mission of the Jackson in Action 83 Foundation is to provide support to military families. The foundation’s focus is on the educational, emotional, and physical health of the children. As a military charity, input is received from a variety of sources to better appreciate family needs. Through a number of specific programs, the Jackson in Action 83 Foundation is making a difference. This is not only true in Tampa Bay but also beyond. Danny Dogtags – Vincent and his wife, Lindsey, have published two books in the Danny Dogtags book series. The first book helps families discuss emotions and issues surrounding military deployment. The second book addresses health, wellness, and ways to live an active lifestyle. Military Moms Baby Shower – This annual program provides 40 expecting or recently delivered military moms with donations of gifts and support needed to care for their newborns. Youth in Action Camp – Through this one-day camp, the foundation seeks to fulfill its physical health mission objectives. Kids ages six to 12-years old from military families can register to attend this free event. 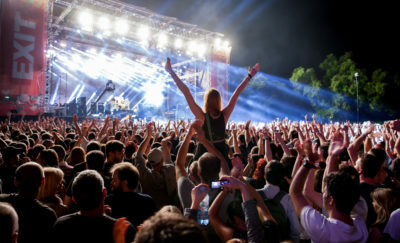 The camp is held each June on MacDill Air Force Base and is hosted by Jackson himself. Salute to Reading – The Jackson in Action 83 Foundation also promotes academic achievement and education as part of its mission. This program provides incentives and recognition for reading achievements to third, fourth, and fifth graders at three elementary schools in and around MacDill Air Force Base. Salute to Scholars – To further its objectives in promoting education, the Foundation also awards $6,500 in scholarship funds each year. These scholarships are awarded to graduating seniors who are dependents of active duty/reserves, retired, or deceased members of the military. In 2019, the foundation expanded the Salute to Scholars program to include $4,000 in scholarships to veterans who are continuing their education in order to join the civilian workforce. Truly, Jackson appreciates the importance of both a loving family and the advantages of education and health. However, he also appreciates the struggles that military deployment and the military lifestyle can bring for children and spouses. 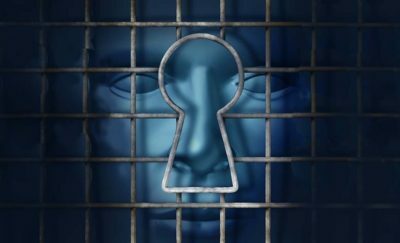 Armed with these insights, his foundation offers holistic support to help overcome these difficulties. In doing so, the Jackson in Action 83 Foundation does its part in honoring military service personnel in the Tampa area. At the same time, it strives to create leaders for tomorrow along the way. “Many former athletes have a foundation. Few have the passion, commitment, execution and ultimately results that VJ has demonstrated. He does it for the right reasons, does not care about the credit and in my opinion has created one of the strongest military based foundations in the country, if not the strongest. As a board member from day one, I’ve seen first hand his hands-on approach, impassioned drive and unwavering purpose behind helping military families. His “Oprah” style baby shower where hundreds of Moms have each walked away with thousands of dollars of baby essentials gets bigger every year and is just one example of many going on behind the scenes that this man is orchestrating,” Jay Mize Entrepreneur and Jackson in Action 83 Board Member. The Foundation is a bold military charity that does much for the community – credit Jackson for starting it. 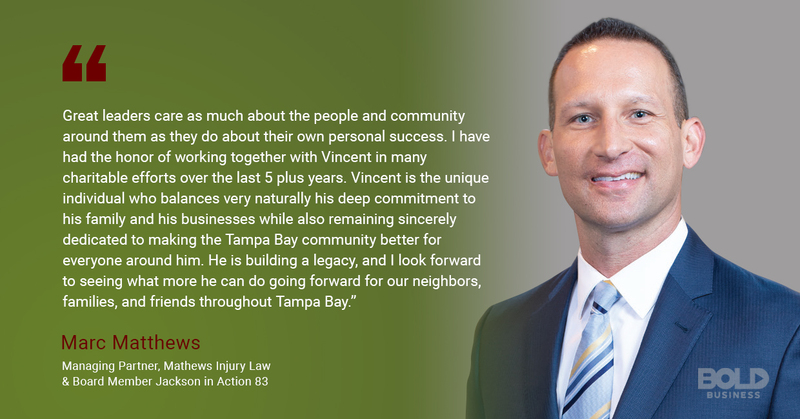 For more on Vincent Jackson, check out this week’s Bold Leader Spotlight. For more coverage on military leaders, see our reporting on Naval Academy Commandant Captain Robb Chadwick, Marine Corps Lt. General Lori Reynolds, and the first female Blue Angels Pilot Marine Corps Major Katie Higgins Cook.